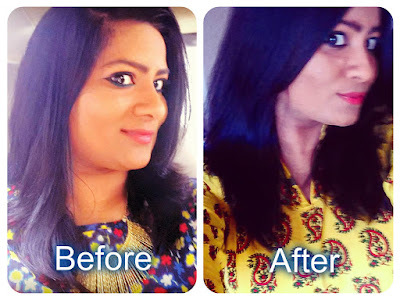 A month back I wrote this post about the day we spent at the Bodycraft salon in Koramangala to experience the new hair treatment called Nioxin. I was given the product to use for a month and write my experience about it. 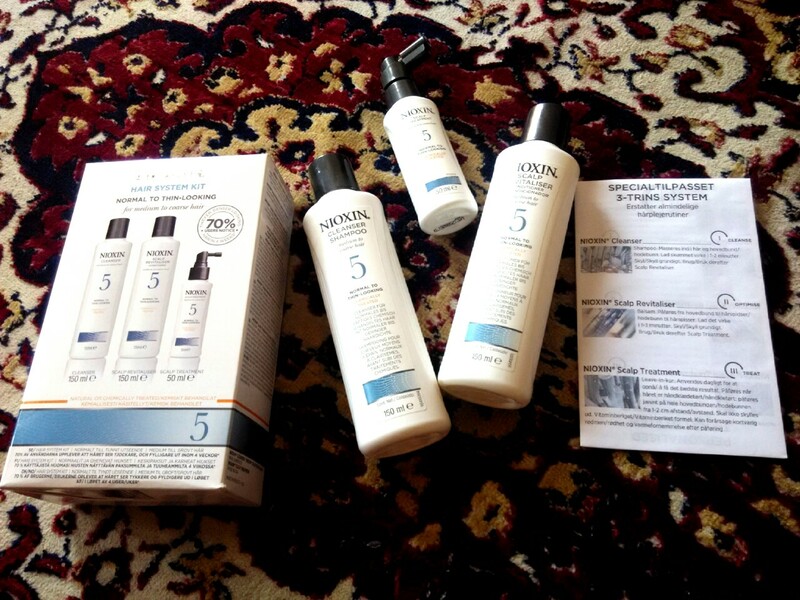 The Nioxin system that was given to me was for the type 5, that was for normal thinning hair. Nioxin is a system that helps in preventing thinning of the hair. Nothing else. Until I saw a really close view of my hair, I was not aware that I have thin hair. At the risk of sounding extremely narcissistic I'm going to say that I have really good hair and I take care of it very well. So when I was told that I had thin hair, I could not take it lightly. I was determined to solve the problem and was happy that I had the Nioxin treatment with me to help combat the thinning. The treatment consists of three steps. First, a cleanser or a shampoo. Second, a revitaliser or a conditioner. And third, a leave in serum. I'm very particular about the products I use on my hair. 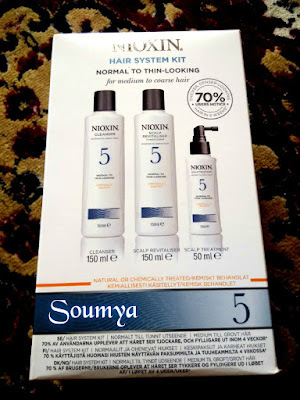 But after experiencing the Nioxin products at the salon, I was happy to try this one. But when I started using the products, there seemed to be a difference in the product used at the salon and the one given to me. The cleanser was transparent and smelt yummy, just like it did in the salon. But it did not lather well. In the salon it lathered so beautifully that I felt like my hair was a loofah. But at home, irrespective of the quantity of the product I used it hardly lathered. The revitaliser was cloudy and smooth. It spread easily on the hair and I used it all over the scalp as well. In the salon, my scalp had felt cool during this process. But at home, nothing. It was just like any other regular conditioner. I kept the conditioner for a good ten minutes before washing it off. At the salon, my hair turned so smooth after washing. But at home, the texture of the hair remained the same. The leave in treatment serum was unlike any other serum I have used. I normally use the Moroccan Oil serum, which makes my hair so soft and silky. The texture of the Nioxin serum was water like. Foamy water actually. I applied it directly onto the scalp from the bottle and spread it evenly. I let it stay for a few minutes, before I dried and styled my hair. The serum does not help the hair. The scalp maybe. I had to use my old serum to help smoothen my hair. I used the Nioxin system every alternate day, for a whole month. So what happened? Did it help my hair in any way? Well, I have no answer to this. My hair looks and feels exactly the same as it previously was. I had not noticed any thinning earlier so I'm not sure if the thinning has reduced now. Maybe I need to get under that hair scanner again to notice a difference. Since the texture of my hair was already good, I expected the Nioxin system to enhance it. But nothing of that sort happened. It did not cause any damage either. No hair loss or roughness. But I did not have that earlier either. My hair looks and feels really good exactly like how it was before. This system did nothing different than my existing hair products. But I'm glad that it did not harm my hair in anyway. Maybe this is a good product. I just am not the right candidate to use this product. If I see my hair follicles under the scanner again and notice that all the strands are uniformly thick, then I would change my mind. Having said that, I have had a wonderful experience using this product. Right from meeting my blogger friends and making new friends to getting pampered for a day. Thank to team Blogadda for arranging this meet and this activity. Aren't all the shampoos the same? Which ever I use, I get the same result- Nothing! No, not all shampoos are the same. Some work wonders on the hair ans some trouble it to the core. I think you have wonderful hair already. Hey, someone I know was asking for a blogger who's willing to do some product reviews. I wasn't sure if you would be interested but I gave her your name and asked her to check with you... Hope that's ok.
All hair products are same and have marketing tactics. Salon products will never be sold since they would run out of business if they do. Only thing to be glad of is that it didn't harm your hair. I know! I had quite some expectations from it though. Soums - your experience is almost exactly like mine, except my hair's a lot thinner - and the Nioxin treatment didn't make me feel as good as my usual regimen does. In fact, the leave in product annoyed me. Ah well...I am looking at the silver lining. Several in fact, including the ones in my hair ;-) Always good to meet up!